Who knew that there is a way to make healthy fried foods?! For healthy fried foods –> It’s all in the fat: the kind you use matters. I use beef tallow or lard and love it – it doesn’t make me sick like vegetable oils do, and doesn’t leave a thick film in my mouth. Here's where to get beef tallow online from grass-fed cows or get the bigger economy size of beef tallow here. Here's where to buy pastured lard. Here's more about the BEST and healthiest oil for frying and all the benefits, plus a Q&A on beef tallow, storing it, etc. For healthy fried foods –> You’ll want to be careful that you don't go over the smoke point no matter what fat you’re using, this risks the formation of free-radicals/cell damage, which can cause cancer. Read about the fryer that I use, but if I had to do it over again, I'd look for a Glass-Bowl Deep Fryer to avoid the Teflon, or I was also looking at this bigger fryer with a stainless steel interior! It also has a nice temperature control and handy baskets. Read about when I ditched my Teflon electric frying pan. For healthy fried foods –> Whatever food you're frying, use the best quality that you can. Use organic vegetables grown in nutrient-rich soil whenever possible. For safe meats, if you can't find it locally, you can order healthy and safe meat here to the avoid conventional feedlot mystery meat from the store. For healthy fried foods –> If you're using a batter, be sure to make your own to avoid MSG and other scary ingredients in store-bought batter mixes. Try this simple beer batter recipe! Beer battered fish – especially good on a sandwich with simple homemade mayo! Battered Shrimp, try dipping in a homemade cilantro lime chile mayo. 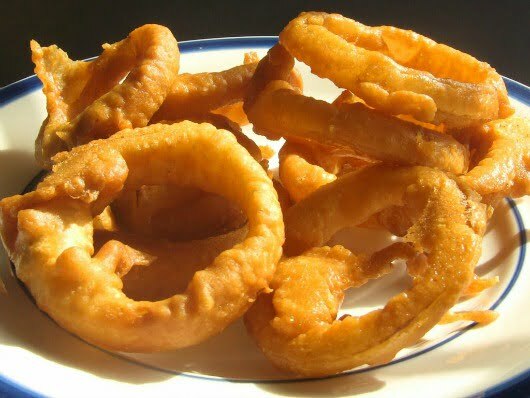 Onion rings – yes, you can eat onion rings guilt-free! Heat your beef tallow to between 350-375* (If it’s not hot enough, the food will be soggy, if it's too hot you'll go over the smoke point, as mentioned above.) Don't have a thermometer? Here's a trick I read: Drop a piece of bread into the oil, if it takes one minute to brown, the oil is 165*. In the meantime, make your batter. Not too thick or it will be “bready”, not too thin or it will drip off in the oil. Drop into the hot fat and cook ‘til golden brown. Remove and drain for a bit on paper towels. Move to a cookie sheet in the oven at 200*ish to keep them hot until serving. Side note: Have you ever wanted to try a TO YOUR DOOR meal service? I finally found one that I can recommend (I'm sort of picky ya know), just click here to check it out. It all comes in a box (with an ice pack for the meats) and it's actually pretty affordable especially compared to eating out, and even more when you consider the food is higher quality than any restaurants, since it's rare to find one that has pastured meats and organic ingredients! It only takes 30 minutes or less of prep work before you eat, but there's no shopping, no planning, just pick out your meals online that look good to you (the two we got were really tasty! ), then just spend a very few minutes in the kitchen and you're done. Click here to learn more. 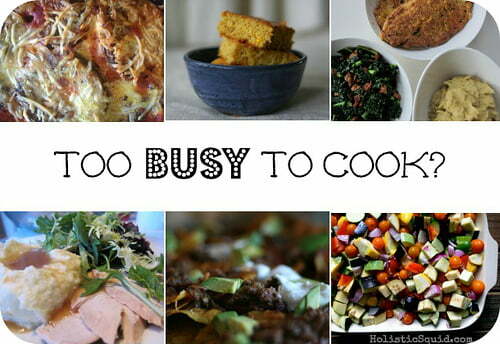 Or just get some meal planning help! 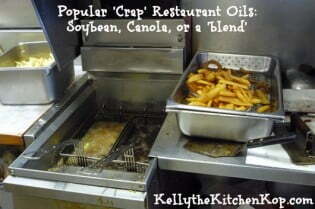 Did I tell you about the time I realized I probably shouldn't have told this chef he was using crap oils in his fryer? Here's where to find beef tallow online at a great price or if the big tub of tallow at that link is out of stock, try the smaller tub. 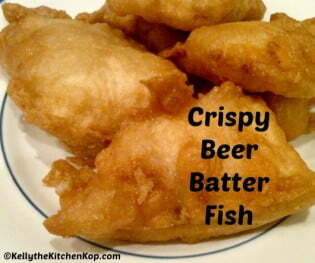 Try this beer batter recipe! Try some homemade Fast Food French Fries! We have a free standing 5-6 gallon fryer in our outdoor kitchen. 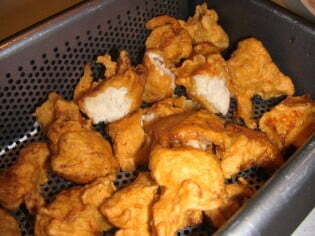 We have been using peanut oil and we reuse it many times and leave it in the fryer until it’s time to change the oil. How many times could I reuse beef tallow and could it be left in the fryer outdoors? It has a lid and then we put a canvas cover over it. Wow, how handy Catherine! Yes, you could leave tallow outside and covered, you could also reuse it many times (like you do the peanut oil), but I don’t know exactly how many is “okay”, I think it’s pretty stable though, so we usually reuse it maybe 3-4 times? I tell people that peanut oil is okay if it’s not used real often, because it’s high in omega-6 fats, but tallow from grassfed cows is so much better for us. great. now all I want for supper is fried things…but I don’t have a deep fryer yet. I would like one of everything! I am stingy with my tallow as I only get some when I cook up beef – and my lard is precious too – but sometimes you just HAVE to fry something and it is out of this world! Kelly, I swear, more people need to read this! If only everyone knew. So much flavor, so much fun to be had. When I learned that deep-frying in the good fats was ok, it released me. At my house, we like to do a deep-fried feast, starting with mild foods like fruit and veg and doughnuts, and working our way through every type of food imaginable, until we finish with fishy-things. Mmmm. I think it’s about time for that now! Hallelujiah!! LOL…seriously great post…I for one am glad that I can still have some fried treats now and again. And now I’m craving onion rings. Go figure. Jennifer, that’s a great question. Thankfully we can reuse 3-4 times, but still, it gets thrown out and the cost adds up. I tend to lean toward tallow or lard for sure, though, just because it’s much less processed. I think the expeller pressed coc. oil goes through a few different stages to get that coco taste and smell out. I’ve been looking into switching over my cooking oils and have been wondering a lot about what to use for frying. I’ve always used canola oil, believing it to be healthy but also, it’s cheap which doesn’t make me feel bad about using so much and then having to dispose of it after use. However, I’m now realizing that canola oil is NOT healthy and have been looking into other options. I’m wondering what is your opinion on using expeller pressed coconut oil for frying versus the tallow, as it seems to be much cheaper, especially when you consider that again, you have to use a significant amount and then dispose? The beef tallow looks great but does seem to be more expensive. I’m planning on doing some switching over to virgin coconut oil for general use, but the frying question has been bugging me (although I don’t fry stuff often, I do especially love making homemade chips and salsa!!). Thanks! Gina, try it and let us know! Oooh, I wonder if you could use coconut flour for the batter? Eh? Eh? My batter mix is white rice flour plus an egg white and salt. It’s a very traditional Chinese batter – slightly chewy, crispy and full of flavour. I don’ t suppose there is much phytic acid left in white rice, and I don’t worry about using white rice since it is such a small amount you end up eating. Also Chinese recipes recommend letting the batter sit for a few hours which is often the case for traditional (Indian, French, English) batter recipies. The sitting time probably improves flavour and possibly increases digestibility. You always come up with the most thought provoking posts…I am not a deep frying kind of girl. It just isn’t my thing. But I do appreciate the info you share. 🙂 I absolutely agree about the healthy vs. unhealthy fats. It’s so very true. Yum! I love fried food, but don’t often cook it. I should try it, because anything I fry myself in healthy oils with healthy batter is going to be so much better than what I can buy anywhere. I was too! When I was single and working a lot, I used to use boxes of pasta, jars of tomato sauce, pre-made pizza dough (from Trader Joe’s — you just roll it out and bake it), and boxes of crackers with cheese. For a while I got addicted to pop-tarts and I would almost always eat out for lunch. Of course I had terrible dental problems — all that white flour and not a lot of good homecooked meals. I was too busy working all the time. I ended up with a root canal and a ton of cavities. Lanise, Yes, I just grind the rice on fine in my family mill. That is also what I use to make waffles and pancakes. I skip all the gluten free flour extras. For the zucchini sticks have just used an egg wash then seasoned breadcrumb (sourdough or sprouted bread) mix. I have not yet made apple fritters the NT way yet, but I would just take any batter recipe and use sprouted flour or soak it overnight in say, buttermilk. I think I remember a recipe in EFLF for eggplant fritters. I think the recipe called for half the soaked pancake recipe as the batter. I’m sure that would work too. Ann Marie, you’ve never heard of Drakes Mix because you were never a boxes and bags kind of cook like I used to be!!! Christine, what do you use for batter? Do you just grind uncoiled brown rice in a wheat grinder? I’d love to try that. Thanks. weird! My name seems to have gotten lost up above! I make the standard beer batter recipe form Joy of cooking with a few changes…. I grind Brown rice for the flour, and I use only milk for the liquid, as beer has gluten in it. I also add one extra egg as well, since rice four does not bind as well. Fried zucchini blossoms (stuffed with cheese). What is Drakes Mix? I never heard of it. I dip my food in a milk/egg or cream/egg mixture and then dredge in sprouted flour or sourdough breadcrumbs (or a combo of the two). You know what’s neat? Since frying is such work, we don’t do it that often. It’s a special treat that everyone looks forward to. One thing though — you don’t have to heat your oven up to 350 to keep fried foods warm. I set mine at the lowest setting and it stays plenty warm. Peel and core your apples with one of those core removers that looks like a cyllinder. Then slice apples into rings, dip in batter and fry. Once you take them out of the oil, you shake them around with a cinnamon and sugar mix. Maple sugar would be good! Oh yeah! I know I could make the zucchini sticks the same as in the recipe above, but how do you make apple fritters? Kent would be so happy if I made these! You’re forgetting apple fritters! Or battered zucchini sticks!